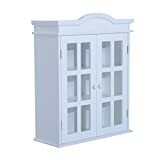 This HOMCOM wall mounted cabinet is a great way to create more storage requirements you may need. Made from MDf with wooden framed doors with acrylic windows, this gives a great feel and look for any bathroom. With 2 shelves and ample storage it can be functional for everyday use.